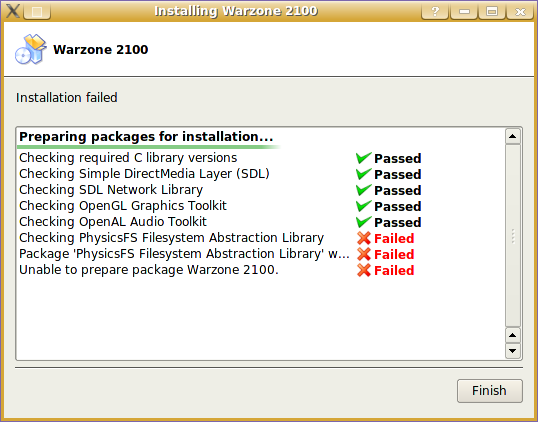 Warzone 2100 looks like a really interesting game, and I wanted to try it out. On their web site I noticed that they provide an Autopackage. I’ve never tried those things out before, but now I was in a hurry to test the game, so I thought to myself “What the heck, this things are supposed to just work”. Can somebody please remind me, what was so wrong about apt-get now again? UPDATE: Since autopackage (the really-very-super-mega-simple-package-manager) failed, I grabbed the source archive and compiled the game myself instead. As expected, that worked without a glitch.. I used to have a blog at blog.backa97.org, but one fine(?) day, my web host disappeared into the void. Since then I’ve been trying out different blog hosting services, but I’ve none of them really made me happy. I was using WordPress on my site, and I was happy with it. Then a friend told me about the WordPress blog hosting service here at wordpress.com and a signed up. Now I’m happy and can get back to blogging again!